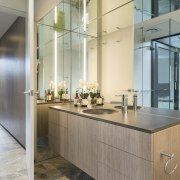 The sights and sounds of nature are integral to the design of this home, by owner/architect Craig Rossetti. A giant individualistically framed window wall echoes the forms of nature, while a staggered roof form acts like a giant trickling water sculpture in the rain or filters the sunlight. You could be forgiven for walking right past the entry to this home. 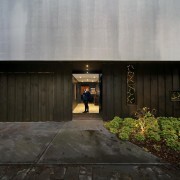 Accessed via a bluestone lane the house's front door, garage door and the whole stern facade pick up on the aesthetic of the timber fencing of its laneway neighbours. 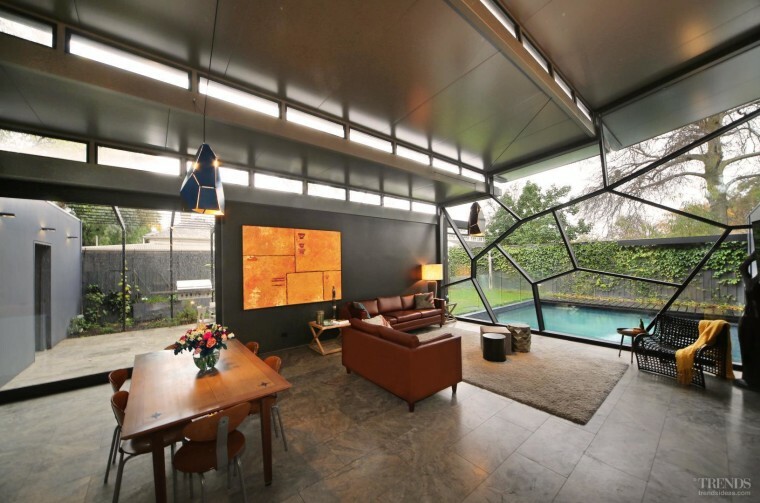 Designed by architect Craig Rossetti, the residence is his own family home. 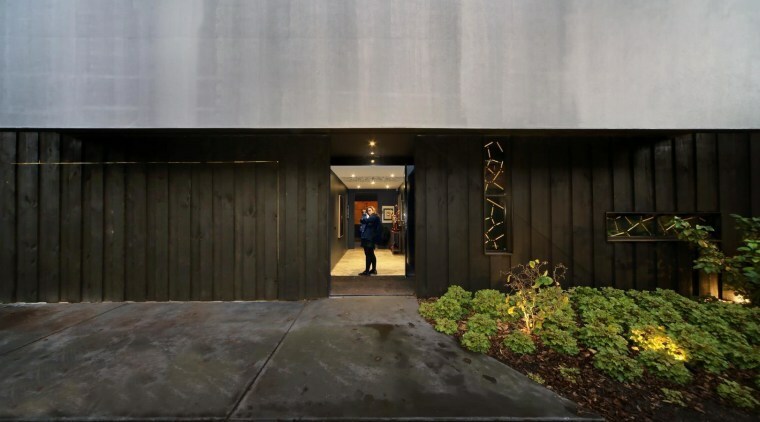 The laneway approach is because this house is built on the subdivided rear of a section that's home to a genteel Victorian residence, thereby saving the 1900s building from demolition. "Entering the house from the understated front door, guests pass through a deliberately compressed hall before stepping out into the soaring double-height living and dining space," says Rossetti. 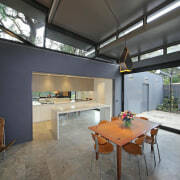 To create setbacks from side boundaries to reduce the visual bulk of the residence to neighbouring properties, the architect positioned the kitchen and services areas along one boundary as these rooms didn't require much height. 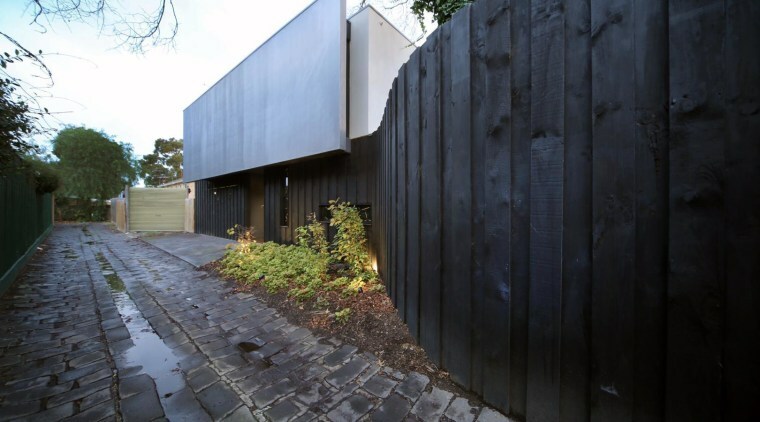 This home's hidden entry echoes the fencing along the cobblestone laneway used to access it. Similarly, the adult wing – comprising a bathroom, study, cellar, guest bedroom and the master suite at the end – tapers down towards the other side boundary. These are also a low-set run of rooms. 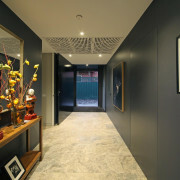 However, the dramatic home's central space, makes a much grander impression. 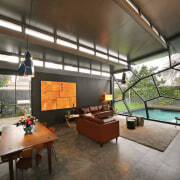 The leading feature of this living space – and really the defining feature of the home – is the giant steel and glass curtain wall at one end of the room that soars five metres to the stepped roofline. This is created in an arresting fenestration pattern that can loosely be described as crazy paving. The patterning has an abstract, sculptural quality but also echoes the tree branches and other variegated lines of nature seen across the pool in the rear yard. And the view out is only half of the story. Playing across a white privacy screen on the upper section of an adjacent wall, the shadows of the window structure and the landscape cast patterns as the sun shifts throughout the day. "The idea for this window design came from looking at the pleasing effects seen in crackled glazing on pottery – essentially, the fractals of nature formed under the heat of the kiln." However, the window wall's rakish, crazy angles are about more than a great aesthetic. 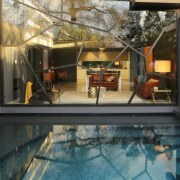 "Given the size of the curtain wall, the double laminated glass had to be in sections and structurally supported. While the hollow steel frame patterning looks random it is in fact designed to transfer pressure downwards to each junction providing structural strength and support for the roof." 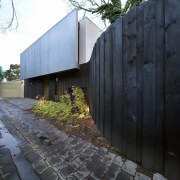 Positioned in a side lane, the front door to this new home literally disappears into the fencing woodwork. 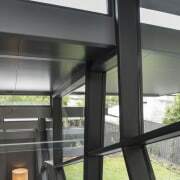 If the individualistic glass curtain wall is an arresting sight, so too is the unexpected stepped roof – which also connects with nature. "The unorthodox use of refrigeration panels to create a cantilevering roofline provides protection from the hot Australian summer sun. Yet in winter, the room is awash with light and warmth, providing passive heating to the house, controlled by a series of internal windows." And given Australia's dry, hot environment, water as a resource and as visual relief were central to the Rossetti's vision for the architecture. 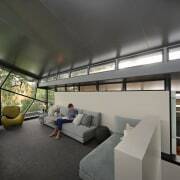 "The floating roof panels have no gutters and the vertical glazing connecting them reveals the rain cascading or trickling down. The rain is collected instead in square side gutters that feed the 30,000L underground greywater tank – the old property's repurposed swimming pool." In addition, the pool water laps right against the curtain wall, and water shadows race across the interior from both the clerestory windows and curtain wall. The effect is most dramatic in heavy rain, when the water really jumps to life. 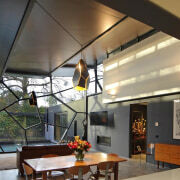 The second level of the home overlooks the living room but is screened for privacy by the white wall section. This is the domain of the architect's teenage twins, having two bedrooms, a bathroom and living space. From up here, the view takes in the gently reflective light through clerestory glazing, while the ends of the high space look out to adjacent backyard landscapes. The central living area flows directly to the outdoor dining space and an entirely edible garden, where every plant yields a fruit, herb or seed – all part of the force-of-nature philosophy.